The politics of cross-border sewage flows have gotten so bad, the issue necessitated its own article today. 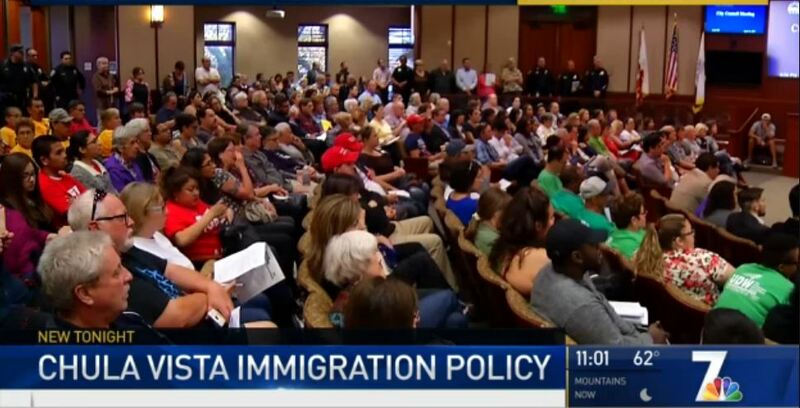 Chula Vista City Council Chambers saw a full-house as about 50 speakers gave public testimony on whether Chula Vista should be designated a “sanctuary city.” The Council decided to support a state sanctuary bill and sign on to a legal brief challenging President Trump’s executive order to strip funding form sanctuary jurisdictions. The vote was 3-2 with Councilmembers McCann and Diaz opposed. The council also agreed to join the “Welcoming America” network. A subsequent op-ed piece explained that Diaz had misstated facts. In 2014 there were 9,967 victims of alcohol or drug related driving impairment, not the 47,000 Diaz alleges. In addition, academic studies found there is no evidence of higher crime rates in cities with sanctuary policies. For many years, the Otay Mesa Road winding up to San Ysidro High School was dangerous and nothing was being done to fix it. Thanks to sustained community protests, the road improvements are underway. This week, the city announced that the project is 50% complete. Phase two begins in April with the haul off of 12,000 Cubic Yards of dirt that will expand the width of Otay Mesa Road making it safer for pedestrian, vehicular and bike travel. Project completion is anticipated in summer 2018. 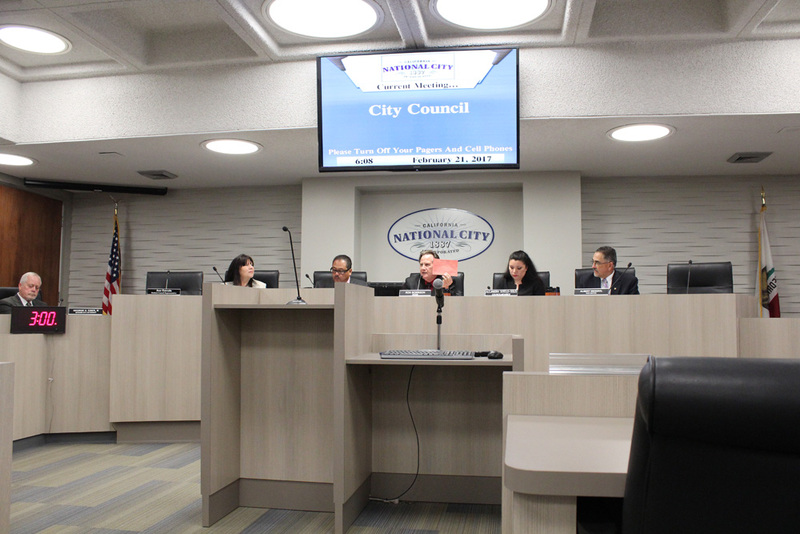 Seriously disappointed National City “majority.” I have been your loyal Assemblywoman. I simply asked you to hold off before opposing my SANDAG reform bill, but I couldn’t get that courtesy even after agreeing to work on Mayor’s concerns. Thank you — as usual — Alejandra Sotelo-Solis and Mona Rios. Gonzalez is referring to AB 805 which “would create an audit committee and hire an independent auditor at SANDAG, in hopes of preventing another budgeting scandal, after Voice of San Diego revealed that SANDAG leadership knowingly overstated how much money a sales tax hike would bring in and understated costs of transportation projects voters already approved. Andy Keatts at Voice of San Diego explained the bill more thoroughly. It is with great disappointment that the “majority” (Morrison, Cano, Mendivil) AGAIN did not vote for the “will of the people” and Assemblywoman Gonzalez Fletcher and a request to postpone any decision until amended language or direct discussion with the Assemblywoman was concluded. The vote was 3-2 to move forward to draft a letter in OPPOSITION to Assembly Bill 805. La Bella Pizza Gareden in downtown Chula Vista has 13 handles on tap, nine are craft beers. Here’s the great article about their beer. Their food is excellent too.